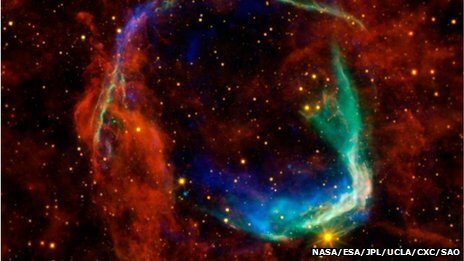 The supernova RCW 86 lit up the sky for eight months, documented at the time as a "guest star". In more recent times, astronomers have wondered how it grew so large, so fast. Space telescope observations now suggest that before exploding, a wind of material from the star blew a cavity around it, into which the supernova could expand much more quickly. The supernova, about 8,000 light-years away, is huge - if the infrared light it emits could be seen by our eyes, it would appear to be as large in the sky as the full Moon. The findings, published in the Astrophysical Journal, combine existing data from the Chandra X-ray telescope and the XMM-Newton Observatory with recent images from the US space agency Nasa's Spitzer and Wide-field Infrared Survey (Wise) telescopes. another smoke mystery thread, help!